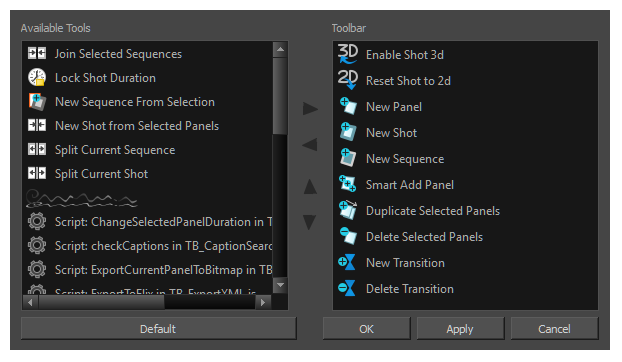 Some of the toolbars can be customized with your favourite tools and options. You can also organize the toolbars to suit your working preferences. The Tools toolbar can only be customized if the Flat Tools Toolbar preference is enabled. This preference allows you to display all the tools instead of having some of them grouped as drop-downs. Right-click (Windows) or Ctrl+click (macOS) on any button in a toolbar and select Customize. The Toolbar Manager dialog box opens. Add a new icon to a toolbar: Select a tool/command from the Available Tools list and click the Right Arrow button. Remove an icon from a toolbar: Select a tool/command in the Toolbar list and click the Left Arrow button to remove it from the toolbar. Reorder icons in a toolbar: Select a tool/command in the Toolbar list and click the Up or Down Arrow buttons to reposition it. Click Apply to apply the changes without closing the Toolbar Manager dialog box or click OK to apply the changes and close the window. Select File > Preferences (Windows) or Storyboard Pro > Preferences (macOS). Press Ctrl + U (Windows) or ⌘ + , (Mac OS X). In the Toolbars section, select the Flat Tool Toolbar option. Restart Storyboard Pro. Once the software is restarted, you can customize the Tools toolbar.